One of the last of the towering giants of our field is gone. 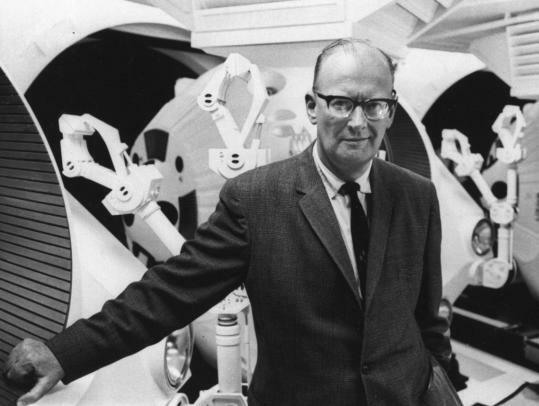 Sir Arthur C. Clarke has died at the age of 90. I learned of it when my daughter called from college to tell me she’d seen it on the BBC news site. (There’s a much better obituary in the Washington Post, also reprinted in the Boston Globe.) I was stunned, even though I knew I shouldn’t be; his health had been frail for years. Nonetheless, I feel deeply saddened, and at the same time grateful for the wonders of the imagination that he brought us all. Like many of my generation, I grew up inspired by AsimovHeinleinClarke, as well as many of their contemporaries. With Sir Arthur’s passing, that towering triumvirate is all gone now. In this world, all that remains is their work, and memories. Which, come to think of it, is a pretty impressive monument. I never met Arthur Clarke, but we corresponded briefly when I was in college. (Correspondence is probably glorifying it, but that’s how I choose to remember it.) When Neil Armstrong and Buzz Aldrin walked on the moon, Arthur Clarke was there with Walter Cronkite, covering the story. Being a big fan of Clarke’s at the time (in particular, I loved his short stories and the short novel Against the Fall of Night), I wrote to him in care of CBS News, telling him how great it was to see him there on TV with Walter Cronkite. A week or so later, I got a postcard back from him, thanking me. He’d written it as he was departing for his home on Sri Lanka. He and I shared a love of something besides science and science fiction, particularly science fiction with transcendent themes—and that was scuba diving. That’s something I’d always wished we could have talked about. It was not to be, in this world. Maybe in the next. If you or your readers haven’t seen it yet, here’s a link to Clarke’s video message released by his office for his 90th birthday. And thanks for your personal memory, Jeff. It is a sad day–saying goodbye to A.C.Clarke. I too grew up inspired by him, Asimov, Heinlein and Andre Norton. Great authors–great stuff all. New authors are coming up–twinkling stars, meteors, shining suns but the four corners of the watchtowers, Asimov, Clarke, Heinlein and Norton were supernovas. I bow to them and am honored to have had their words alter and improve my life. When I turned on my car radio this am on my way out of the garage they were just starting the story of his life on NPR. It was both a sad and happy way to start my day. I was sad to hear that he’d left us, but I was happy that I caught the story at the beginning so I heard the whole thing and got to hear about the inspirational story of his life. A lot of people feel that his best contribution to science fiction was that he really “brought the science” into the genre, but for me it was just his overall vision of the future that always left me in awe after reading one of his stories. His stories allowed me to expand my mind and made me aware of a universe so much bigger than myself and I appreciate his efforts in helping me enjoy some of the wonder of it all! Thank you Arthur C. Clarke for not only your own contributions to both the written and real worlds but also for inspiring others to continue down the path you helped illuminate! It’s amazing how much Clarke’s writings meant to so many people. I’ve been seeing tributes to him all over the place. Thanks for that video link, Victoria. Here’s another, to two stories on NPR’s Morning Edition and All Things Considered. but one thing about Sir Clarke, he was known for his dalliances with young boys in Sri Lanka, he was gay but he never admitted it. Why the silence on this? Nothing wrong with being gay, or liking young boys, but why the media and blog silence? ACC was accused of child molestation, and cleared of the charges. Beyond that, his sexual preferences are none of my business. Or anyone else’s.